ISLAMABAD (92 News) – 92 News has on Saturday obtained the copy of the affidavit submitted by Tariq Shafi, cousin of Prime Minister Nawaz Sharif before Joint Investigation Team (JIT) formed to probe Panama Papers case. According to the copy of the affidavit, Tariq Shafi is the resident of 182-Model Town Lahore and the affidavit was declared as the continuity of the affidavit submitted on November 12, 2016 which aimed at proving the selling of Gulf Steel Mill. 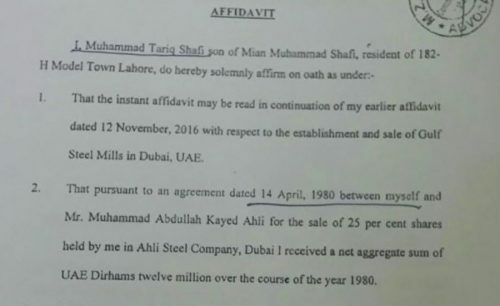 In the affidavit, Tariq Shafi stated that the pursuant to an agreement dated April 14, 1980 between himself and Mr Muhammad Abdullah Kayed Ahli for the sale of 25 percent shares held by him in Ahli Steel Company, Dubai. He said that he received a net aggregate sum of UAE Dirhams 12 million over the course of the year 1980.